Chasing Asylum provides a powerful and emotional look at the human impact of Australia’s cruelty to refugees. 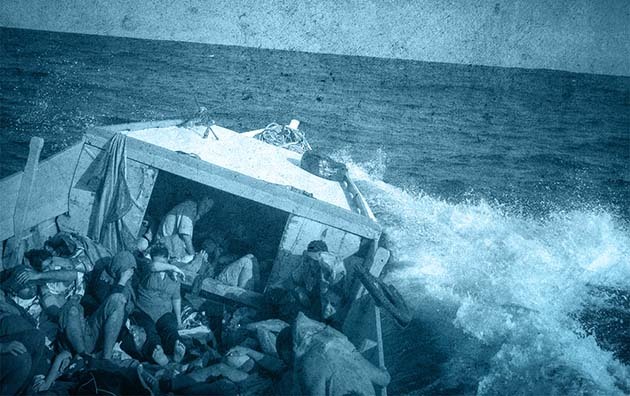 The film skillfully mixes statements from former Liberal and Labor Prime Ministers, Immigration Ministers and Navy commanders with the brutal realities for refugees. This contrast sharply exposes the political rhetoric as callous contempt for the lives of others. The Australian government has gone to great lengths to hide what is happening inside offshore detention, banning journalists and lawyers, and threatening whistle-blowers with two years’ jail. The film breaks open that secrecy. The damning footage filmed inside the offshore detention camps is one of the film’s strengths. It includes smuggled-out interviews with detainees and snapshots of the appalling conditions, and bleak daily life for imprisoned refugees. Indefinite detention has caused many to develop mental illnesses, a few have even returned home, only to flee again to seek asylum elsewhere. The film covers many of the well-known crimes of offshore detention from the murder of Reza Barati to the death of Hamid Kehazaei, but even people familiar with those stories will gain new insights into Australia’s efforts to break people. The interviews with former detention centre workers are compelling. They speak about their journeys from naivety to outrage at what is being done to the people they thought they were there to help. Their stories add to the grim and heart breaking first-hand footage. Chasing Asylum also shows the impact on UNHCR refugees left in limbo in Indonesia by Australia’s “stop the boats” policies. One man stuck in Indonesia seems to be coping with daily life, despite an inability to work, study or get health care—until he talks about being indefinitely separated from his son in Australia. It is a poignant vignette, but only begins to scrape the surface of life in limbo in Indonesia. Stories have emerged of unaccompanied minors selling their bodies to survive and of refugees bribing their way into Australian funded Indonesian detention centres as they run out of funds. The film is not perfect. There a couple of interviews that go nowhere in particular, like the interview with Reza Barati’s parents. Barati’s parents say that he was looking for a better life, but the film doesn’t point out that Barati was part of the persecuted Kurdish minority in Iran who are not recognised as citizens. The film condemns offshore processing as a failed response to “deaths at sea”, but it never explicitly challenges the idea this is genuine concern of the major parties. Deaths at sea and offshore processing are not two evils that must be weighed against each other. The same politicians who deliver offshore cruelty delivered policies that made deaths at sea more likely by making voyages less safe (from burning of boats to criminalising people smuggling) and set the tone for rescue services responding too slowly or not at all. SIEV 358 is a good example. The WA coroner found that 16 distress calls, including news that the boat was taking on water, were ignored for two days by Australian authorities. Over 100 people drowned. Chasing Asylum ends with a dedication to Malcolm Fraser, who is interviewed in the film saying that Australia took 100,000 refugees from Vietnam because “it was the right thing to do”. But this glosses over the reality of the time. Fraser supported the Vietnam War which caused the refugee crisis. He did a deal for Australia to take more refugees so long as Malaysia and Indonesia would stop the boats travelling on to Australia. This left much greater numbers languishing in camps like Galang in Indonesia, which was only closed in 1996. While the film shows some of the inspiring resistance of the refugees themselves (though strangely not the mass hunger strike of 800 on Manus Island in January 2015), the refugee movement fighting for change in Australia is absent. This would have been a useful antidote to the film’s interview with Age journalist Michael Bachelard who claims that the detention horrors have happened because “we let them”—implying that it is the Australian electorate to blame. Bachelard’s claim ignores both how anti-refugee sentiment has been whipped up by politicians and the mainstream media, and how the refugee movement can shift public opinion. It did so under Howard, and is beginning to do so again. Recent polls over the 267 people from Nauru and Manus currently in Australia, found that 40 per cent wanted to “Let Them Stay” with 39 per cent against and 21 per cent undecided. Despite minor criticisms, the film remains a must see for its exposure of the offshore detention cruelty that the Australian government is desperate to keep hidden. After the Refugee Action Collective showing to a packed cinema in Melbourne, as in many places around the country, people came out asking what they could do. That part is up to us.